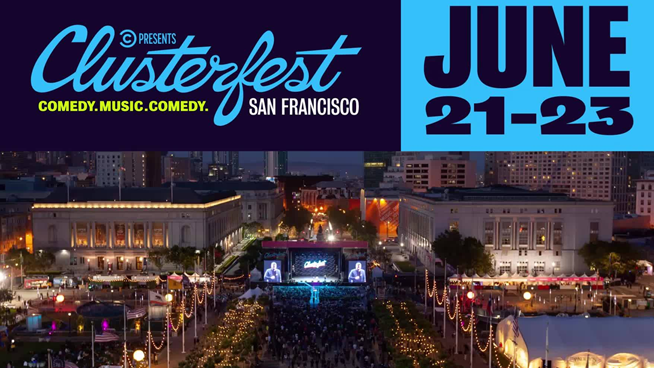 The ever-popular comedy festival Clusterfest returns to the Bill Graham Civic and Civic Center Plaza in San Francisco for it’s third year June 21st-23rd with the lineup of performers being released in March. Put on by the good folks over at Comedy Central, Clusterfest has featured some of the biggest stars in comedy and music including: Jerry Seinfeld, Kevin Hart, Tiffany Haddish, Jonathan Stewart, Ice Cube, Amy Schumer, Trevor Noah, Wu-Tang Clan, Salt-N-Pepa, Tig Notaro, Awkwafina and Action Bronson, among many others. Last year brought the first ever live performance of The Lonely Island with special cameos from Michael Bolton and T-Pain and interactive fan experiences like the full scale version of Paddy’s Pub from It’s Always Sunny in Philadelphia and an interactive installation of the Bluth’s Original Frozen Banana Stand from Arrested Development. Not to mention the slew of unique comedic offerings including Broad City’s Abbi Jacobson and Ilana Glazer leading a live-read of Wayne’s World and a live reading of the cult classic Spice World by stars of RuPaul’s Drag Race. Pre-sale tickets for Clusterfest go on-sale shortly after the lineup announcement in March over at ClusterFest.com.